An incoming state senator suggested Thursday that Lt. Gov. Dan Patrick will focus on schools, not businesses or sporting venues, with his "bathroom bill." An incoming state senator suggested Thursday that Lt. Gov. Dan Patrick will focus on schools, not businesses or sporting venues, as he crafts an already controversial proposal to prohibit transgender Texans from using bathrooms that match their gender identity. 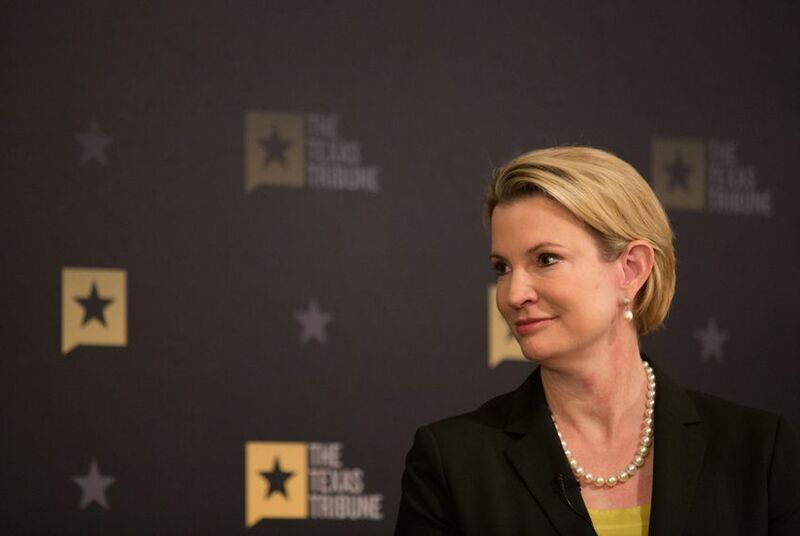 The remarks by state Senator-elect Dawn Buckingham, R-Austin, come as Patrick faces new pressure to abandon the push for a so-called "bathroom bill," which critics say could hurt Texas' economy by making the state appear intolerant. The legislation, which he is calling the Women's Privacy and Business Protection Act, has not yet been released, but the lieutenant governor has named it one of his top 10 priorities for the upcoming session. Asked if she was saying businesses and sporting venues will be exempt under the bill, Buckingham replied, "Well, we'll see what the language looks like, but it's my understanding that that's the intent — to realize that there are some complicating factors there and our priorities are really the schools." Patrick became a national voice on the issue earlier this year, when President Barack Obama issued guidelines directing public schools to accommodate transgender students, including allowing them to use bathrooms matching their gender identity. Asked for comment on Buckingham's remarks, Patrick's office said Buckingham is "correct that the need for this legislation was largely generated by President Obama's presidential bathroom edict that would have forced schools to adopt a politically correct bathroom, locker room and shower policy that was an affront to common sense, safety and decency." Patrick's office also referred back to a statement it issued earlier this week laying out the general scope of the bill. "The women's privacy and business protection act that the lieutenant governor intends to support will assure that sexual predators, like those who exploit the internet, will not be able to freely enter women's restrooms, locker rooms or showers and that businesses are not forced by local ordinances to allow men in women's restrooms and locker rooms," the statement said. "This legislation does not discriminate against any individual or target any group." "It has the support of the overwhelming majority of Texans in both political parties and every racial and ethnic group," added the statement, apparently referring to polling Patrick's political operation recently commissioned. Business leaders are closely watching the legislation as it takes shape, worried it could lead to the kind of uproar that tainted North Carolina's image when it passed a similar bill. On Wednesday, the Texas Association of Business released a study that warned such legislation could cost the Lone Star State between $964 million and $8.5 billion and more than 100,000 jobs. In the statement, Patrick's office dismissed the report as "misinformation and fear-mongering regarding a bill they haven't even seen."